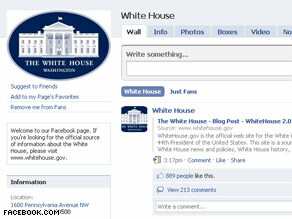 The White House now has a page on the popular social networking site Facebook. "Today the White House is taking steps to expand how the administration is communicating with the public," the White House blog says. "Technology has profoundly impacted how - and where - we all consume information and communicate with one another. WhiteHouse.gov is an important part of the Administration's effort to use the internet to reach the public quickly and effectively - but it isn't the only place." The blog post contains links to the White House's pages on Twitter, Facebook, MySpace, Flickr, Vimeo, YouTube, and iTunes. "The WhiteHouse blog will power a lot of the content in these networks," the blog post explains, "but we're looking forward to hearing from our fans, friends and followers." "We want to make the White House more open and accessible for the American people," Obama spokesman Nick Shapiro said earlier this week about the administration's new official Flickr photostream. Making official images available on the photo sharing site "is just one way we are using the Internet and new media technology to accomplish that." During the White House race, Obama's campaign pioneered extensive use of social networking technologies that helped power him into the Oval Office.